Anne Maree Healey initiated the Atelier web page for members of PSST and writes monthly installments. She is chair of Pastels Revisited, the PSST members exhibition of small paintings. View her website. PSST: Why are you an artist and how did you choose to become an artist? AMH: I HAVE ALWAYS been fascinated by design, movement and storytelling. As early as 6 or 7 years of age, I remember pleading with my parents to take me to the stationers to buy coloring pencils and paper to draw pictures, or a pen and some paper to write stories. I grew up in Australia and in primary and secondary school (elementary/middle and high school in American equivalency) my favorite subjects were Art, Art History, English Expression and English Literature, later followed by Legal Studies. Art was not considered a great way to make a living by my family so I didn’t initially study Fine Art at University. Instead, I studied Legal Studies and Human Resources Management whilst painting in oils and pastel on the side in my spare time. I attended the Glassell School in Houston in the early 2000s for four years covering all the foundational subjects, as well as watercolor with Arthur Turner. It was not until I was in my early forties that I studied Art History at Charles Sturt University, NSW, Australia as a distance ed. student and then in January 2010 we were moved to Boston and found Jeanne Rosier Smith, PSA. It was then that I started pastel painting in earnest again. Since that time I have attended many workshops and continue to paint as often as I can. However, I never called myself a fine artist/painter until about two years ago when I was juried into my first pastel show in Connecticut. My husband then gave me an ipad with my name and the word Artist after it. So it seems it became official, at least for me! PSST: Where do you paint? How is it set up? 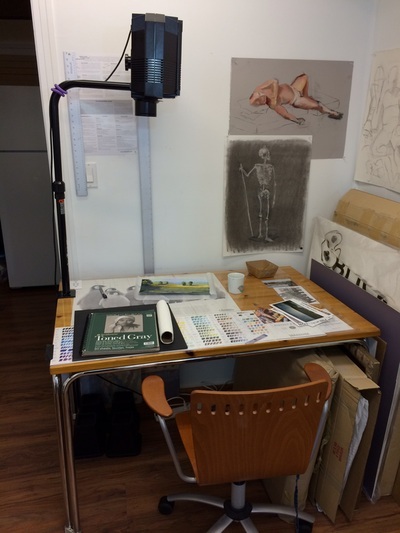 AMH: I SHARE A STUDIO with a fellow portrait artist. I go to this little spot each day and we both jokingly refer to it as our shed. My workspace has three easels in the painting room, a table holding my pastels, another table for other tasks, artificial lighting or daylight lighting using photographers lamps and a paper bale. PSST: What is your subject matter? How do you choose it? AMH: I WORK IN SERIES and my subject matter always tells a story. I enjoy painting a moment, a mood or an interaction with beautiful lighting. So, my subject matter is people interacting with each other, animals interacting with each other, or collections of objects that tell a story. I mainly work from photographs for my current Patriots series but do make time to get outside and paint landscapes, and streetscapes. I also setup for still life in the studio especially if it is too hot and humid to get outside. I evaluate my subjects in terms of design and lighting and test my choices by completing value sketches and notans. Hope this sounds familiar! I play with colors before starting to paint to ensure the selected colors have a wide range of values and temperature (relative warms and cools). AMH: ALL THREE: academic, self-taught and workshops. Undergraduate studies in art history from Charles Sturt University, NSW, Australia. Studio art studies from the Glassell here in Houston, as well as workshops with many wonderful pastelists: Jeanne Rosier-Smith, Liz Haywood-Sullivan, Alain Picard, Robert Carsten, Bill Schneider, Richard McKinley, Barbara Jaenicke, and classes with various drawing teachers: Justin Life, Joy Dai Buell, Ariel Masson, and most recently have enjoyed two sessions with Brenda Hash, a fellow PSST member. AMH: DEFINITELY MY HUSBAND and partner in crime of the past thirty years. My dear friends: Jeanne and fellow students at Jeanne Rosier Smith’s Atelier in Sudbury, Mass. as well as our critique group in Massachusetts, the equivalent of which I hope to get started in Houston later this year. AMH: IRA GLASS ON CREATIVITY is currently on my mind and on my studio wall. His message is very simple: “What nobody tells people who are beginners — and I really wish someone had told this to me . . . is that all of us who do creative work, we get into it because we have good taste. But there is this gap. For the first couple years you make stuff, and it’s just not that good. It’s trying to be good, it has potential, but it’s not. But your taste, the thing that got you into the game, is still killer. And your taste is why your work disappoints you. A lot of people never get past this phase. They quit. Most people I know who do interesting, creative work went through years of this. We know our work doesn’t have this special thing that we want it to have. We all go through this. And if you are just starting out or you are still in this phase, you gotta know it’s normal and the most important thing you can do is do a lot of work. Put yourself on a deadline so that every week you will finish one story (or painting). 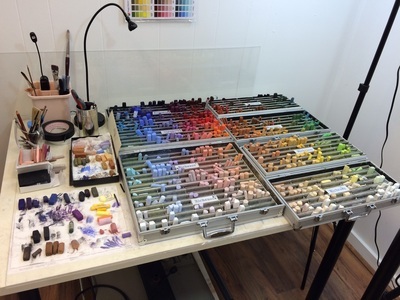 PSST: What is your ‘favorite thing” you use in painting? A special gadget or tool you have discovered or a special technique that you have developed that you would pass on to others? AMH: A SKEWER: a wooden satay stick that I use as a measuring tool that enables me to measure forms vertically and horizontally. You can pick up these sticks in the supermarket or from kitchen stores. I do keep one that I have coloured black with a sharpie and one that is left au natural in my kit at all times. PSST: How do you describe your painting style and colour choices? AMH: PAINTERLY AND CONTEMPORARY with lost and found edges, loose and messy yet decisive mark making? This is my goal but honestly, I think my style and knowledge of color is constantly evolving. For me, color is a challenge in that I try to paint the local color of any subject yet attempt to push into all those gorgeous reflected colors I see when I glance at an object with fresh eyes. I know, this sounds ridiculous but consider the 3-D form - is a red apple really completely red? Is could be several shades of red with blue or green mixed in for a shadow, or gold or yellow hues to create the illusion of warm light? Or maybe it is turquoise leaning to tinted blue to create the illusion of cool light? I’m still working on it I guess. Color and light are constant companions in my painterly, contemporary style. PSST: If you paint from life, describe an interesting or funny experience? AMH: PAINTING IN SOUTHERN FRANCE and being approached by a gallery manager to bring my work to her at the end of the day so she could choose pieces. I was such a newbie and was so unsure about her offer. She offered her business card, which I took, but at the end of the day I felt my work was not good enough. Then five minutes later, a group of tourists who did not speak english at all started asking me for a portrait and offered me forty euros. (Lots of hand gesticulating and waiving of euros). I shook my head in embarrassment and wondered what I was doing to attract such attention. This was my fourth day painting in St. Paul de Vence, Provence! Next time I’ll be braver, maybe …. AMH: PROBABLY ONE OF THE SEA LIONS SERIES but then again, I haven’t painted my best painting yet. Still working on that one! AMH: THE PLEIN AIR CONFERENCE AND IAPS CONFERENCE are my next events. I have entered paintings in each show and would love to be selected. 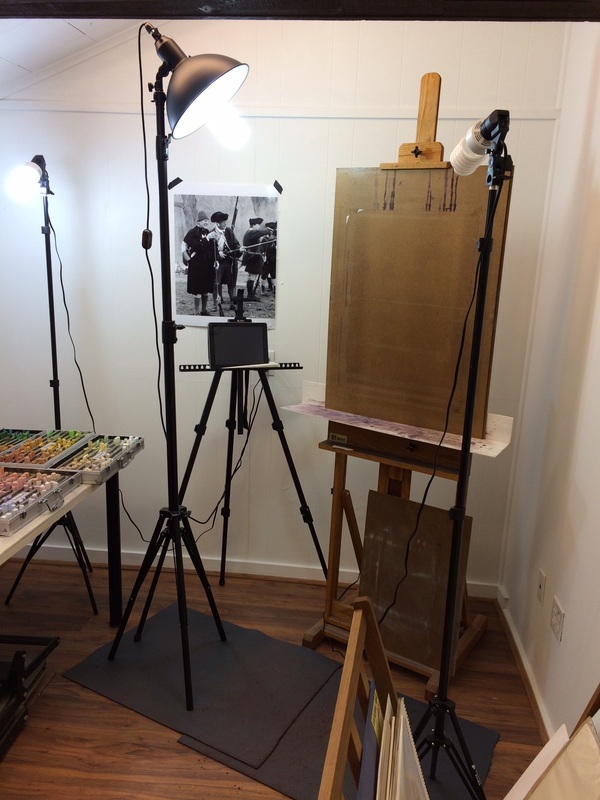 Otherwise, I do have an easel booked for the Plein Air Conference in Monterey in April so will definitely get to display three works as well as paint each day in the afternoon amongst people I really admire. AMH: RECOMMENDATION is the best way to describe how my work started selling in Massachusetts. In Houston, I will be seeking Gallery representation but first I need a substantial body of work. This year I am taking time to build five complete series. PSST: Do you have any marketing or exhibiting tips that you would like to share? TO PRODUCE PAINTINGS THAT I AM PROUD OF that capture the fleeting, an emotion, or an insight that viewers of my work recognize and enjoy. To enter as many shows as I can to gain PSA. To problem solve and enjoy a finished painting. To meet other painters and share ideas and tips. AMH: Perhaps empathy, something that draws them to gaze further and enjoy the subject matter, or the technical skills presented. I guess everyone comes to a painting with their own life experiences and their own take away. I hope the viewer sees something about my work that both fascinates and delights.